Annie Rosen, a mezzo-soprano of “bright promise” (Chicago Tribune), is a 2017 graduate of the Patrick G. and Shirley W. Ryan Opera Center Ensemble of the Lyric Opera of Chicago; her performance in the Ensemble’s 2017 showcase was recognized as “the evening’s tour-de-force” by the Chicago Tribune. Rosen began her first season at the Ryan Center jumping in as Mélisande/Pelléas et Melisande in rehearsal with the Chicago Symphony Orchestra conducted by Esa-Pekka Salonen; she then “knocked the ball out of the park” (Chicago Classical Review) in her Lyric Opera debut as Tisbe/La Cenerentola, conducted by Sir Andrew Davis. Later in the season, Rosen created the role of Edith Thibault in the world premiere of Bel Canto, which aired on PBS’s Great Performances series in January 2017. This past season, Rosen understudied Adalgisa/Norma and performed Ascagne/Les Troyens, Wellgunde/Das Rheingold, and Second Lady/Die Zauberflöte, all at the Lyric Opera. Upcoming engagements include recording Bernstein’s A Quiet Place with the Orchestre symphonique de Montréal under the baton of Kent Nagano, her Wolf Trap Opera debut as Stepmother/The Juniper Tree, and a return to the Lyric Opera of Chicago. as Siébel/Faust. In 2014-15, Rosen joined the roster of the Metropolitan Opera for its anticipated production of Die Frau ohne Schatten. As an apprentice at the Santa Fe Opera, she covered the role of Ni Gui-Zhen in the U.S. premiere of Huang Ruo’s Mandarin-language opera Dr. Sun Yat-Sen and performed the role of Kitty Oppenheimer in a scene from John Adams’ Doctor Atomic. Other highlights of 2014-15 included residencies at Avaloch Farm Music Institute and Banff Music Centre, where Rosen worked with Heartbeat Opera to fully stage György Kurtág’s Kafka-Fragmente for voice and violin, culminating in performances in New York City that Opera News called “extraordinary…a fully-fleshed spectrum of emotion and experience” and The Wall Street Journal, “savage, moving, and – when appropriate – funny.” Also in 2014-15, Rosen returned to the New York Festival of Song, performing in its new music series and the NYFOS annual Spring gala. Rosen was the 2012 winner of the Opera Foundation’s American Berlin Scholarship. In 2012-13, she performed twelve roles at the Deutsche Oper Berlin, including Zweite Dame/Die Zauberflöte, Mercédès/Carmen, and Sméraldine/L’amour des trois oranges. 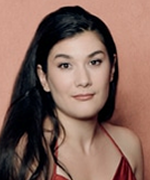 Rosen then made her Italian debut as Giannetta in a new production of L’elisir d’amore at the Teatro Regio di Torino. Rosen is also a passionate chamber musician and recitalist. She is a core member of Cantata Profana, a New York City-based chamber ensemble honored by Chamber Music America for its adventurous programming of contemporary repertoire. Works performed with the group include Berio’s Folk Songs, Ligeti’s Nouvelles aventures, Thomas Adès’ Life Story, and songs of Stravinsky and Webern. Rosen’s solo recital repertoire stretches from Monteverdi and Handel, through Schumann and Shostakovich, to world premieres of Hindi and Farsi songs by Indian-American composer Reena Esmail. Rosen was a Semifinalist in the 2012 Metropolitan Opera National Council Auditions. She holds additional awards from the Gerda Lissner Foundation, the Santa Fe Opera and Central City Opera, and the Connecticut Opera Guild. She is a recipient of the Shoshana Foundation’s Richard F. Gold Career Grant and the Louis Sudler Prize in the Performing and Creative Arts. A New Haven, CT native, Rosen earned degrees in musicology and performance from Yale University and Mannes College. This entry was posted in Sacred Music 2017 Soloists by Camerata Chicago. Bookmark the permalink.